Martin Luther King Jr Blvd. + Cherry St.
Open Streets Macon returns Sunday, April 22! Join us as we close the streets to cars and open them to people. Maconites will experience 1.8 miles of car-free streets on Martin Luther King Jr. Blvd. (from the Ocmulgee River to the Industrial District) and Cherry St. (from Cherry Street Plaza to Bernd Park). 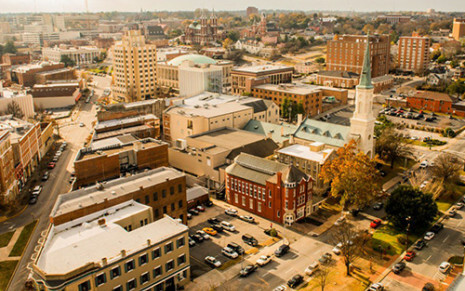 People traffic will replace car traffic, as sections of Downtown Macon streets will be closed to cars and open to YOU! Organized by Bike Walk Macon, Open Streets Macon is a car-free celebration of public space; bringing people together to walk, skate, bike, play, and re-imagine how we use our streets. Come and join, it's free! Open Streets programs, also known as Ciclovias, is a movement to activate people, strengthen businesses, and inspire public spaces by temporarily closing streets to cars. This is a free, regularly occurring program that offers Macon the opportunity to experience city streets in a whole new way, taking an active role in this global movement. The spring 2018 route will connect 3 Macon neighborhoods, the Ocmulgee Heritage Trail, and countless Macon landmarks, restaurants, and businesses via Cherry Street and Martin Luther King Jr Boulevard. View the route map here: http://bit.ly/2ErV2ZU.